THE kiddies rivalry of the recently-held Atty. Rufus B. Rodriguez Open Chess Tournament in Cagayan de Oro bared exciting matches and drama atop the 64-square-board. No less than two-time Association of Southeast Asian Nations chess champion Ruelle “Tawing” Canino of Kauswagan Elementary School fell victim in the intense struggle of wits, nerves and speed. Joseph Alexis dela Rama of City Central School spoiled what seemed to be another title finish of Canino when he upsets his former tormentor in the seventh and final round face-off for grade 4-6 category. However, dela Rama's big catch was not enough to run away with the top prize as Gabriel Tito Oba-ob of Iligan City and Andy James Sabella of Bolisong Elementary School, El Salvador City also won their final matches to force a three-way logjam at six points each. In the ensuing Bucholz tiebreak, Sabella got the better to collar the P1,500 top purse plus trophy. Fellow 6-pointers Oba-ob and dela Rama finished second and third with P1,000 and P800 take-home, also with trophies. 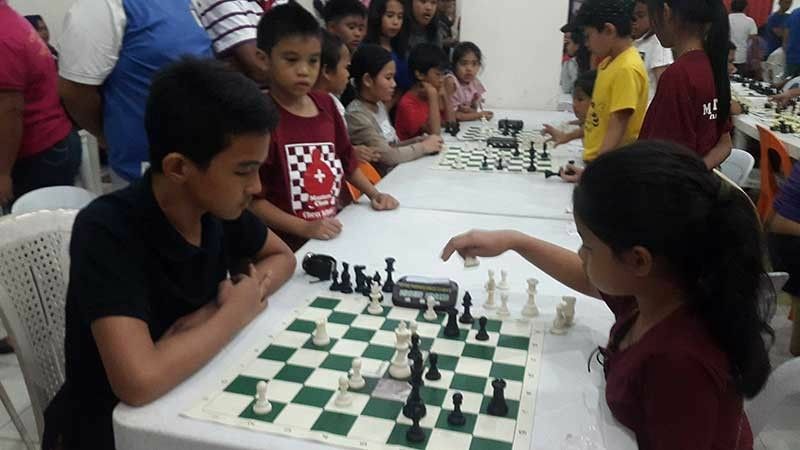 “Grabe na gyod ka competitive ang level sa chess dire sa atong dakbayan especially sa mga bata dili na ma-anticipate kon kinsa ang mo-champion kay equal chances na ang labanan sa mga seeded bets,” said arbiter Lorenzo “Jun” Cuizon. It can be recalled that dela Rama yielded to Canino's endgame savvy during the inaugural show of the NM Roly Tan-backed Masters Class tourney at Limketkai Center. On Saturday, March 23 at the Nazareth gym, the revenge-seeking dela Rama returned the favor as he completely outplayed the black-handling Canino in a Carrokan defense encounter. “Kapoy na gyod ang bata. From Cotabato then to Davao and back in Cagayan de Oro. Supposedly, dili na unta modula ang bata kay exhausted na gyod. Kapoy na gani ang yaya samot na ang player. Have a rest then bawi na lang sa sunod,” said Maria Gina, the ever supportive mother of the bemedalled “Super Tawing” who also became the only triple-gold medalist during the Mindanao leg of the Batang Pinoy Games in Tagum, Davao del Norte. Sharing fourth to ninth place with five points apiece are Santiago Lumancas IV, Canino, Kyla Dalagan, Lyn Getubig, Ralph Lawrence Labradores and Sara Dalagan. Completing the top 18 circle with 4.5 points output are Janiella Maeren Garcia, Nico Tabacuan, Jaeve Joshua Butcon, Khent Lourence Canas, Cassey Miguel Tabamo, Jeshua Lagunay, Honey Jane Salbsab, Christine Lapore and Kenth Cyrell Concon.